Alligators, crocodiles, turtles, snakes, lizards, salamanders, toads, and frogs—all are cold-blooded animals in the reptile or amphibian family. Packed with engaging articles arranged in alphabetical order, the six-volume Exploring the World of Reptiles and Amphibians set looks at the natural history of reptiles and amphibians through naturalistic artwork, maps, and stunning photography. 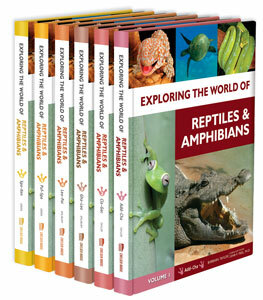 This colorful set is intended to illustrate key life-science principles while providing thorough information on reptiles and amphibians to young readers. In addition to learning the many ways in which different types of creatures hunt, feed, breed, and defend themselves, middle school researchers will also learn about topics such as adaptation, ecology, genetics, communication, conservation and endangered species, and habitats. Each volume features additional resources, such as a glossary, volume index, and a listing of books and Web sites for further reading. “Did You Know?” sidebars that present interesting and little-known facts.